Entering the Kenyan territory by the international airport of Nairobi requires for travelers other than Kenyan citizens a passport valid more than 6 months after passing the police station and a visa. Several possibilities are available to visitors to obtain this visa (online e-visa, visa on arrival or visa in embassy). Some of these methods of procurement are open only to certain nationalities. 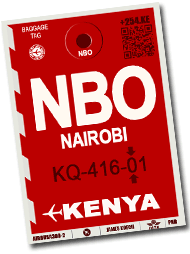 WARNING: bi-national passengers who can not prove their Kenyan citizenship (passport or ID card) are also subject to visa requirements. No vaccination is required to enter Kenya's territory. However, an international vaccination certificate indicating your protection against yellow fever may be required if you are traveling from a country victim of an epidemic. This vaccination can be done at the airport. If you feel unwell or require medical assistance while at JKIA, you may go to the port health clinic. Chemist shops are also available at the airport. Some products can not cross borders on arrival or departure without special authorization. This is the case of animal remains, live animals and certain items of historical heritage of Kenya. Thank you to contact the Veterinary Services or the Ministry of Culture if you have any doubt about this type of product . Hazardous products (firearms, explosives, corrosives, pressurized container, etc.) are generally prohibited or regulated. Thank you to contact your airline to find out its policy on the transportation of these products. Furthermore, a strict control of drugs is carried out by airport police officers. The canine brigade, through its specially trained dogs to search for drugs in luggage, allows regular cocaine seizure. Moreover , the mere consumption of cannabis can lead to penalties of up to 6 months in prison. Searches can be performed randomly on passengers. However, chewing of a locally grown shrub called "miraa" or "khat" is allowed.